The following are some basic tips for preventing, preparing for, and responding to fire in your mobile home. Be careful not to overload electrical circuits. Lights that flicker or dim indicate trouble that must be corrected. When replacing fuses, install only recommended fuses. Only use fuses and breakers that are the proper size for the wire. If you are inexperienced in working with electricity, don't try to correct electrical problems yourself. Call a qualified electrician. Extension cords are meant for temporary use only. If you find yourself using one year-round, move the appliance so that it can be plugged directly into the wall or call a qualified electrician to install an additional outlet. Never plug heating devices into extension cords and make certain that an extension cord is heavy-duty enough to handle whatever is plugged into it. Power strips with their own circuit breakers may be used for entertainment centers and computer systems. Watch for and replace frayed or broken electrical cords and never run cords under rugs. Only buy electrical appliances and equipment approved by a certified testing laboratory, and make sure all electrical appliances are properly installed and maintained. Also, keep dust from accumulating on televisions and other appliances. Never leave cooking unattended. If you must answer the phone or go to the door, take a spoon or hot pan holder with you to remind you that you must return quickly. Keep pan handles turned in toward the center of the stove and wear short or tight-fitting sleeves while cooking. Keep combustibles away from the stove and maintain cooking areas, including the hood and duct, free of grease and dust. In case of a grease fire in a pan, NEVER attempt to pick up the flaming pan. Instead, slide a lid or cookie sheet onto the pan, turn off the heat, and wait for it to cool. Clean or change furnace filters regularly. Replace disposable filters and wash, brush, or vacuum permanent filters. Check the furnace exhaust vent. Clear obstructions such as leaves or animal nests from the vent pipe. Inspect the blower motor with the power off. Vacuum any accumulated dirt. If the owner's manual calls for it, oil the motor. Inspect the V-belt and pulleys for wear. Tighten the belt if it moves more than an inch when you push it. Check air intake. 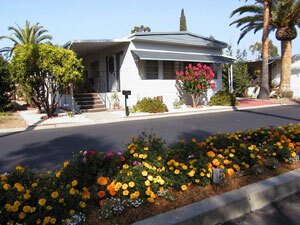 Most mobile home furnaces draw combustion air from beneath the home. To allow air to pass freely beneath the home, the skirting should have four to six vents and they should all be kept clear. Replace carpeting in the furnace compartment with sheet metal or other fireproof material. Newer home furnaces have wire mesh in front of the stack to prevent storage on top of the furnace. If this mesh is missing, replace it. Be sure the thermostat on your furnace is in good working condition by keeping it clean. Have it checked regularly by a heating professional. Clean out debris in the furnace area. Never use your furnace closet for storage or for drying clothes. Check the flue assembly (when cool) for alignment and rigidity. The flue should run in a straight line from the top of the furnace through the ceiling. Be sure the flue is attached to the furnace collar. Check for loose wiring near the flue. If you find any, move it and secure it well away from the flue pipe. Keep the flue pipe free of excessive deposits of carbon. Have your furnace maintenance person check and clean the flue pipe fuel lines, safety controls, and burner before each heating season. Never attempt to repair gas lines in your mobile home. If you smell gas, get everyone out of the home. Then, from a neighbor's home or the manager's office, call a qualified repair person or the gas company immediately. If possible, shut off the gas main from outside. When using a space heater, it's important to follow the manufacturer's instructions. 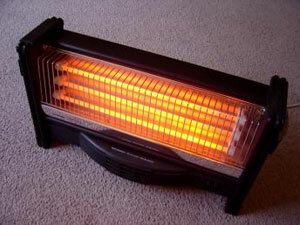 As a general rule, keep electric space heaters at least 36 inches away from anything combustible. Never leave a space heater on when you leave the house or go to bed. It's also dangerous to dry wet clothing over or next to your space heater. Never use your kitchen stove for space heating. California law forbids the use of kerosene heaters for home heating. Maintain temperature at 120-125 degrees. Have it checked at least once a year. If you have a gas heater, pay special attention to the flue area. If the heater is electric, check for loose wiring. The water heater's pressure relief valve should be checked for corrosion. Never close up or cover a floor or wall vent in a gas water heater compartment. Store all matches and lighters out of the reach of children. If small children are a regular part of your household, lock matches and lighters up, as well. Store and use flammable liquids, including gasoline, mineral spirits, lubricants, and nail polish remover properly, away from open flame. Gasoline should never be stored inside your home, and it should never be used for anything except fueling internal combustion engines! Never place combustible material under your home. Keep your home and yard tidy and free of debris. Do not allow magazines, newspapers, and other combustible items to collect. Make certain all exits are clear and easy to reach. Secure candles in non-combustible holders, away from curtains and other flammable items. If smoking is allowed in your home, provide large, deep ashtrays and empty them into metal containers. Check around cushions for smoldering cigarettes before going to bed. No one should ever smoke in bed or while drowsy. Have at least one working smoke detector, probably in the hallway adjacent to bedroom areas. Better yet, have one in each bedroom, as well. 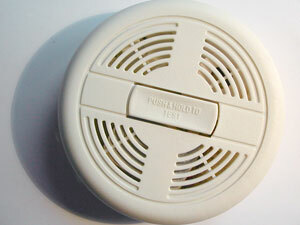 Test the smoke detector and vacuum it every month and whenever you've been away for a week or more. When you change your clocks, change your smoke detector batteries! Have an escape plan and drills. Draw up a plan of your home showing alternate escape routes. Your regular exit may be blocked by fire or smoke. Make certain that you can exit directly from your bedroom, either through a window or escape hatch. Have a fire drill at least twice a year. Have a fire extinguisher handy, near an exit, and learn how to use it before the fire occurs. Get Out! If there is a fire, get out quickly. Do not attempt to take anything with you. Stay low, crawling on the floor under the smoke to avoid toxic gases and super-heated air. Call 9-1-1 from a neighbor's home. Never go back into any burning structure.